Shaquille O’Neal, nicknamed Shaq, is a former NBA center who played for six teams during his 19-year NBA career. O’Neal played for the Orlando Magic from 1992 to 1996, the Los Angeles Lakers from 1996 to 2004, the Miami Heat from 2004 to 2008, the Phoenix Suns from 2008 to 2009, the Cleveland Cavaliers from 2009 to 2010 and the Boston Celtics from 2010 to 2011. Shaquille O’Neal was one of the heaviest players ever to play in the NBA, weighing 325 pounds. O’Neal is a four-time National Champion and was inducted into the Basketball Hall of Fame in 2016. PFP Sports Talent Agency is a top booking agent for motivational sports speakers and sports personalities. 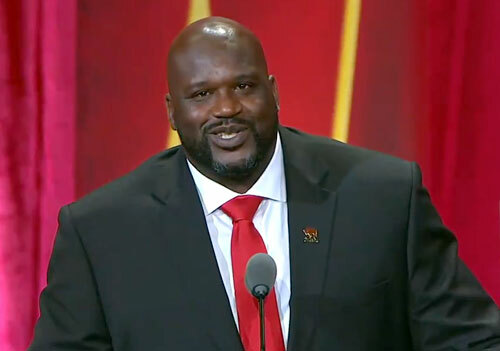 If you would like to book NBA stars like Shaquille O’Neal for a speaking engagement, personal appearance or special event, you can request Shaquille O’Neal agent and speaker information from PFP Sports Talent Agency or call 800.966.1380.